To call High Flying Bird a sports movie would be as reductive as it is misleading. Although very much centered on the game of basketball, Steven Soderbergh’s new Netflix movie is much more interested in boardroom bank shots than actual ball play. Based on a script by Moonlight writer Tarell Alvin McCraney, this unconventional movie uses basketball’s frenzied, competitive energy in order to weave a timely, fable about capitalism, social justice, race, and the love of the game. 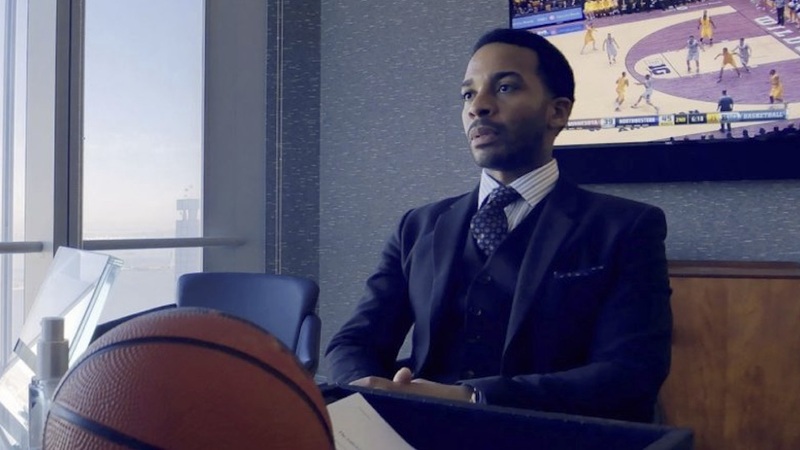 While many of Netflix’s original offerings fade into a blur of shallow distraction, High Flying Bird feels like a film fit for our politically charged and fast-paced times. Ray Burke (André Hollande) is a quick-talking sports agent who represents the number one draft pick Erick Scott (Melvin Gregg). However, the NBA is in the midst of a lockout, so until the owners and the players association can come to agreements on TV sharing and revenue points, everyone’s financial future is uncertain. In the first scene of the film, we find Burke lecturing Scott about financial discipline and the dangers of taking out loans. It’s a quick-fire dressing down as well as being a big-brotherly pep talk, but already in this early scene we see the film’s real agenda trickling through: a ruthless critique on the sports industry as a whole where we find young, talented athletes like Erick Scott being exploited at every turn despite the promises of fame and fortune. This idea that, despite their high salaries and notoriety, these pro-athletes are simply cogs in a big business machine, is dribbled into viewers from this point forward. We see Burke bounce from one meeting to the next, desperately trying to do right by his clients in the face of a system that puts the love of the dollar before any passion for the sport. Throughout, the dialogue feels like David Mamet in Jordans, whip-fast and poetically scatty. With the extraordinary amount of talking in the film, it’s a relief to have someone as mesmerizing and dynamic as André Hollande at its helm. Zazie Beets, who plays Burke’s ambitious ex-assistant Sam, keeps up with Hollande’s pace and energy, delivering both humanism and ruthlessness to her role in equal measure. Soderbergh also uses interviews with former NBA rookies to bookend the scripted scenes, mixing documentary and fiction in order to ground the story in the very serious realities of what professional athletes go through as part of their careers. This innovative approach to storytelling is very similar to what Soderbergh had in mind to do with Moneyball before he was taken off the project due to creative differences. Ten years later though, the world finally seems ready for this new kind of filmmaking, one in which the director gives his audience enough credit to make connections between reality and fiction, weaving McCraney’s story into the real world that inspired it. This is art, this is entertainment, this is what a world-savvy audience living in 2019 is ready for. While High Flying Bird might feel a little isolating for those who aren’t completely au-fait with the sports industry, the kinetic dialogue and the powerhouse performances from its actors do more than enough to keep all viewers interested – even those who don’t know their pick and rolls from their post-ups. If anything, the film’s 90-minute running time feels all too short, like we’re being introduced to the pilot of a new prestige TV series. When the credits roll, we’re left wanting more from this world Soderbergh has created, one in which real issues are tackled in poetic, fascinating style. Soderbergh is forging a new path in sophisticated, snappy filmmaking and High Flying Bird can rightfully take its place as a pioneer for future net-flicks. Stephanie Brandhuber is a freelance film, arts, and culture writer based in London. Deciding to ignore childhood warnings that too much movie-watching would give her square eyes, she went on to gain a Master’s Degree in Film Studies from King’s College London and loves discussing the artistic merits of George Kuchar films with anyone who'll listen. Other achievements include performing tight-rope in a French circus, successfully cooking a soufflé, and being able to do a moderately good Scottish accent.